This bright white patch is known to reflect ultraviolet light, so researchers Ola Fincke and Mingzi Xu of the University of Oklahoma in Norman set out to test whether the ability to reflect this type of light -- which humans can't see -- played a part in the insects' perception of other males wings. The researchers trapped several male damselflies of similar age and size. They painted a thin layer of sheer SPF 45 sunscreen over the white bands on wings, and compared the behavior of these painted males to unpainted controls, as well as controls painted with a sham coat of zinc white. Sunscreen reduced the UV-reflectance of wings by more than half – that is, sunscreen-painted bands appeared less bright – than control or sham treated wings. At the start of the rainy season, unpainted insects won in clashes with sunscreen-painted males in all the scuffles that the researchers observed. But as puddles dried out, contests grew shorter, and painted insects also won a few fights – perhaps because males had less incentive to tussle over space, Fincke explained. Sunscreen appeared to have no effect on the interactions between males and females. In natural skirmishes, damselflies frequently differ in size. Larger males have larger white wing bands; they also win more often. But in this particular study, Xu and Fincke matched males for size and weight, thus diminishing differences in the size of these bands and the flies marked with them, and highlighting the difference in the reflective power of the UV bands. "What we found is that this white patch is a better predictor of fight outcome than body size per se," said Fincke. "It works like a billboard – it's a big advertising sign that males might find easier to perceive and compare than size when they're flying around [in a fight]." Regardless of how the flies behaved during a fight, the researchers found that males with a less bright wing band – the sunscreen-painted individuals – were more likely to lose. "From this study we can conclude that the brightness of the UV [patch] influenced the outcome of the fight," Xu explained. Why this band of color plays such a big part in deciding the outcome of fights isn't clear yet. But ornaments that influence male-male competition, such as antlers or dramatic plumage, aren't uncommon amongst animals. The ability to see UV light guides foraging, camouflage and mating in many animals, including birds, reptiles and spiders. But the new results are the first evidence that an ornamental UV-reflecting wing decoration can settle who wins a territorial scrimmage among insects. "The evidence is compelling and clear," said biologist Darrell Kemp of Macquarie University in Australia, who was not involved with the study. "This presents one of the first reasonable cases for these UV signals being involved in contests." However, Kemp and others clarify that for damselflies and other animals, ultraviolet is just another color. "UV is an important part of the visible spectrum for many animals," said Nathan Morehouse of the University of Pittsburgh, who was not involved with this study. "There"s nothing unique about ultraviolet except that we can't see it." Morehouse added that because of this, it may be premature to conclude that these damselflies truly responded only to the change in UV-reflecting properties of the white band. Removing some of the light reflected in the UV-wavelengths may make the white band look like a different color altogether. For human eyes, this would be the equivalent of taking a white pattern and removing the blue or green spectrum wavelengths from it. The pattern would then appear yellow or orange to us. "But it's a bit odd to say that we're paying specific attention to blue or green because we reacted to its absence differently,"said Morehouse. Whether the insects react to this white band's UV-reflecting properties or a change in its color, the new study suggests this patch of wing color plays a strong part in the social lives of giant damselflies. 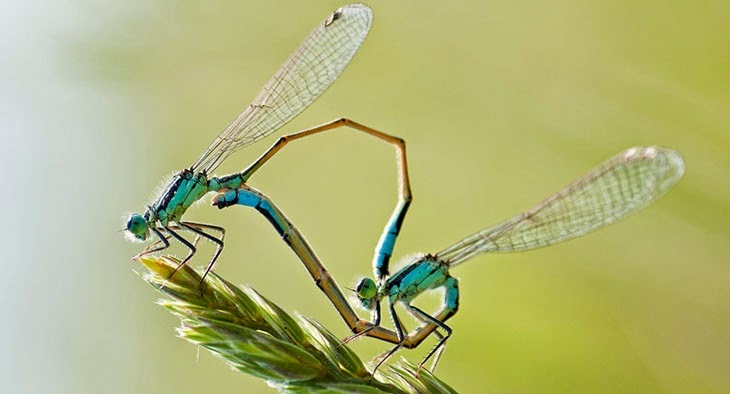 Like butterflies, bees, and other animals, damselflies live in a world where colors – including ones invisible to the human eye – guide their interactions with one another and the environment. "To me, the fact that these animals react to color in their rivals isn't surprising," said Morehouse. "It's just another example of how perceptive they are." I can hardly ever snooze during the night and found this really useful. Thanks for posting, I must say i enjoy reading through your site.